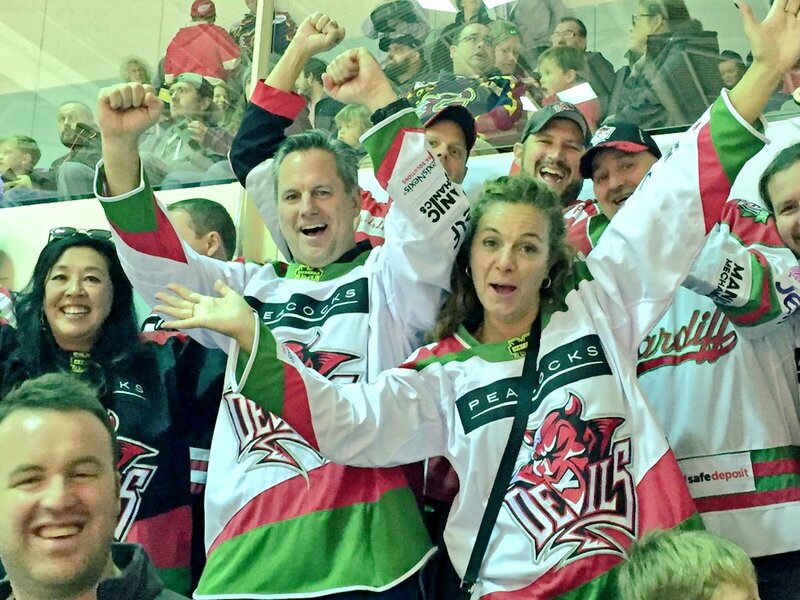 Cardiff Devils owner Brian Parker watched the teams win in Guildford are at Sunday's clash with Glasgow Clan. Cardiff Devils scored three final period goals to earn a 5-2 Challenge Cup group victory at the Spectrum in Guildford. Head coach Andrew Lord and his Devils are top of their group after finishing strongly to douse the Flames. Cardiff ran into penalty trouble and Guildford scored during an early 5v3 powerplay with Calle Ackered firing into the net. Devils levelled the scores after a turnover opened up a 2on1 that saw the initial Charles Linglet shot stopped and Jake Morisette was buried the rebound. Just under seven minutes into the middle period Devils powerplay put them in front when a hard ricochet off the end boards was immediately slammed home by Sean Bentivoglio and the Welsh team were 2-1 ahead after 40 minutes. Cardiff Devils goalscorer Joey Martin. Flames made it 2-2 when Kevin King threw a puck onto the net 11 seconds into the period and it was deflected beyond netminder Ben Bowns. Cardiff were in no mood to let the game drift away, though, and they scored three times to earn the road victory they needed. Man of the match Mike Hedden fired a close range high-wrister into the net and Joey Martin made it 4-2. Welshman Matthew Myers completed the scoring following a clear shorthanded breakaway after 56 minutes. “It’s tough to lose like that when the game was tied with about 15 minutes left,” said Flames coach Paul Dixon. “But there are nights when you just have to say the other team was better than you and certainly Cardiff were better. “Devils have an incredibly deeply and talented team. They are fast and physically strong and secure their own end well. “Their players get sticks in lanes, cut off ice, check hard and are generally extremely difficult to penetrate when you are trying to attack. “Even on the powerplay, a situation we saw a lot of in this net, we were not able to get the same number and quality chances that we often see. Devils bounced back from a 3-2 midweek defeat against Nottingham Panthers and coach Lord said: “We didn’t play great against Panthers and that was an unfortunate loss. “In this game there were two really good teams out there. Flames have a ton of speed and lots of quality. I liked our start outside of the penalties during the first period. “We really shot ourselves in the shoot there. The second was a good quality period and then we managed the puck well with a two-goal lead and closed the game out 5-2. Scorers, Flames: Calle Ackered 1+0, Kevin King 1+0, Kruise Reddick 0+1, Jesse Craig 0+1. Devils: Jake Morissette 1+0, Sean Bentivoglio 1+0, Mike Hedden 1+1, Joey Martin 1+0, Matthew Myers 1+0, Charles Linglet 0+2, Gleason Fournier 0+2, Joey Haddad 0+2, Bryce Reddick 0+1, Stephen Dixon 0+1, Mark Richardson 0+1. Period scores (Flames first): 1-1; 0-1; (1-2); 1-3. The Devils bench at Guildford’s Spectrum Arena. Shots on goal: Flames (on Bowns) 10+6+6=22, Devils (on Fullerton) 16+11+9=36. Special teams: Flames PK 4/5, PP 1/8; Devils PK 7/8, PP 1/5. Stars of the game: Flames, Jesse Craige; Devils, Mike Hedden. Penalties in minutes: Flames 0+11+4=15; Devils 10+17+6=33. Referees: Stefan Hogarth, Tom Pering. Saturday results: Coventry Blaze 2, Glasgow Clan 1; Manchester Storm 4, Milton Keynes Lightning 1; Dundee Stars 5 Belfast Giants 3; Guildford Flames 2 Cardiff Devils 5; Sheffield Steelers 3, Nottingham Panthers 2. Cardiff Devils tickets for Sunday’s match against Glasgow Clan are available online HERE, by phone on 0800 0842 666 or in person at Ice Arena Wales reception right up until puck drop (6pm). Brian Parker, one of the Devils four owners, is in town with his wife Sharon and some of their friends. They have flown in from Canada and will be joining Devils fans pre-game in the bar for a beer. Secure car parking is available at Wilcox house, a short walk from the arena, for £2. The Toys R Us car park is now also available directly opposite the arena. 300 secure parking spots for £3 (only cash accepted). There is still free parking available in the main Ice Arena carpark and the International Pool overflow carpark. CLICK HERE for the updated story on parking options. Post-game skating is back on, this time using the MAIN PAD right after the Devils leave the ice on Sunday. Skating is free, while skates can be rented for £2.